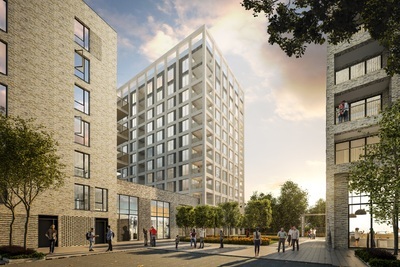 Bellway Homes will be investing over £100m in Beckton after it gained a resolution to grant planning permission to build a brand new urban village overlooking the district park. Derelict buildings will be demolished to make way for 391 homes, 28% of which will be affordable, close to Beckton District Park. The transformation to the former East Ham Industrial Estate, in Newham Way, will include a selection of new studio, one, two and three-bedroom apartments and duplexes and over 6,000 sq. ft. of commercial space, providing homes and a new business hub for Londoners. The scheme that will include 281 private homes, 44 Shared Ownership properties and 66 rented, has been designed to capitalise on views over Beckton District Park, the City and Canary Wharf, with blocks ranging from four to 12 storeys in height. As well as new housing for the popular London borough, Bellway is set to create a new entrance to Beckton District Park, contribute towards improvements to the park, including a new skate park and woodland management. A new public square will be part of the scheme along with play areas for under-fives for each apartment block and improved safety for those using the Cycle Superhighway. As part of this development Bellway will contributing £2m of CIL towards schools, health and leisure facilities in the local area. Ian Gorst, Managing Director of Bellway Homes’ Thames Gateway division, said: “Beckton is an area of East London that, despite its proximity to Canary Wharf and the City, is under-developed. Bellway is delighted to be contributing to the areas transformation especially because the former industrial site has been run down for many years. The development is only four miles east of Canary Wharf making it appealing for local first-time buyers and professionals while the homes will be offered in a range of sizes and layouts, finished with a high-quality specification, and boasting high standards of energy efficiency. The homes are well-located to benefit from the area’s amenities including Beckton’s Asda superstore only half a mile away. Gallions Reach shopping park is just a five-minute drive away, while Barking Road and East Ham High Street are both easily accessible, offering a selection of shops and restaurants. For further retail and leisure options, Westfield Stratford City is reachable via car in around 12-minutes. Ideal for commuters, the DLR from nearby Royal Albert offers connections into Central London and Canary Wharf from Canning Town. The closest underground station is East Ham, which is served by District and Hammersmith & City Lines, and is approximately two miles to the north of the site. The area is also served by an extensive local bus network. For destinations further afield, access to the A13 gives direct links to the M25, and London City Airport is located just one mile away. Demolition is due to start shortly and construction is anticipated to start on site next year. For more information, register your interest by emailing thamesgate-sales[at]bellway.co.uk.